Space heating and domestic hot water production are among the most important factors when it comes to the reduction of fossil energy use and CO2 emissions. In Austria for instance, those domains account for around 30% of the total national energy consumption. For comparison, traffic and manufacturing contribute with about 33% and 30%, respectively (Statistik Austria, 2014). Approximately half of the heat is produced by means of fossil fuels, which are mainly oil and natural gas (Statistik Austria, 2013). The average energy consumption of the Austrian households for residential heating and air-conditioning in 2012 was 159 kWh/(m2a). 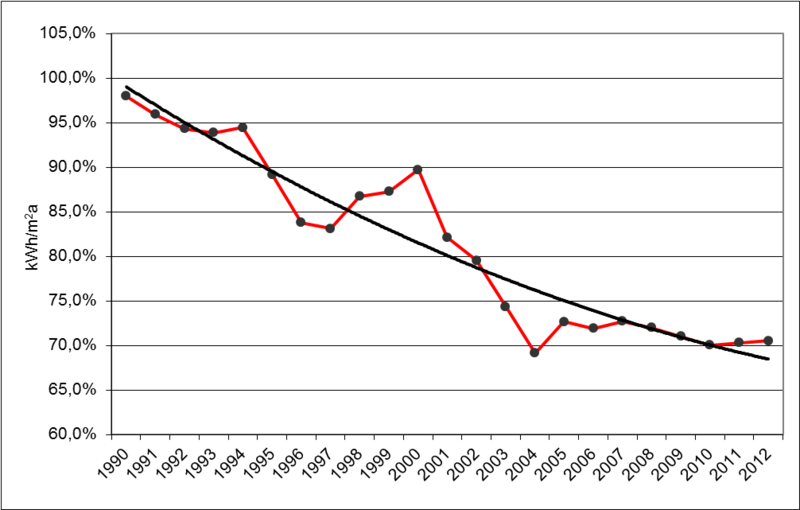 Since 1990 the specific energy consumption in kWh/(m²a) of the households was continuously declining by nearly 30%. But the heating load is very much dependent on the year of construction and possible thermal refurbishment of the building envelope. For example for buildings built in Austria before 1945 the energy demand for space heating was about 190 kWh/m²a, for single family houses built in the period of 2002 to 2007 it is about 50 kWh/m2, for multifamily buildings this value was in 1990 already 60 to 70 kWh/m²a. Due to building codes and subsidy schemes values of about 50-60 kWh/m²a for single (and two) dwelling buildings and 40-50 kWh/(m²a) for multi dwelling buildings are achieved and also passive house concepts are now more frequently used. Approx. 50% of the current dwelling stock in Austria is centrally heated whereas 24% is equipped with access to district heating networks. The heating system installed depends on both the age and the type of dwelling. The share of gas and self-contained central heating systems and single stoves is significantly higher in older buildings, whereas central heating systems and access to district heating systems became popular form the 70ties onwards. 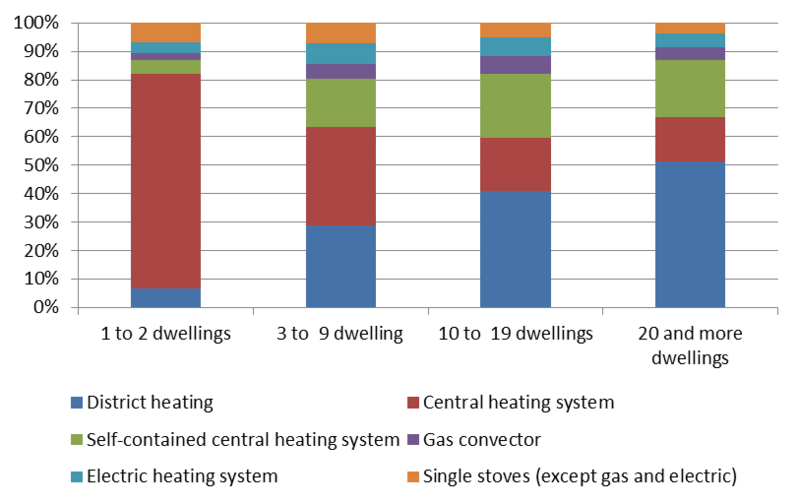 Figure Structure of heating systems in Austrian dwellings in 2013 broken down at dwelling type. Fossil fuels are still the predominant source of energy for heating dwellings in Austria, although renewables are gaining on importance. Natural gas, oil and coal are used in nearly half of the dwellings. Renewables – biomass (20%), solar (1%) and heat pump systems (2%) – are covering about 23% of the heating demand. (Statistik Austria, 2013). The following figure gives an overview of the used energy source for space heating in Austrian dwellings in 2011/2012. The market for RES technologies was characterized by an inhomogeneous development in the last years due to the relatively high but increasingly stable price for raw oil of a bit more than 100 $/barrel as well as continuing slow conjuncture. Moreover certain effects concerning private households which were originally caused by the financial and economic crisis may now come to an end. Finally the various market developments in 2013 were caused by additional technological treats. Biomass boilers and furnaces as well as solar thermal energy decreased clearly on the market in 2013 whereas the market figures of heat pumps became stable on a high level. The decrease of the technologies is partly due to the competition with photovoltaics for private investment resources and area resources. Actually the main market of the heating resources moves bit by bit from new buildings to renovation whereby the actually small renovation installments will become a major influencing factor in the future. (Biermayr et al, 2014). Assuming a technical lifetime of 20 years, there are currently about 210.000 heat pumps in operation in Austria. In 2013, the majority of them is used in residential buildings for heating and DHW (around 60%), 36% are implemented for hot water production only, the rest is used for ventilation or de-humidifcation. 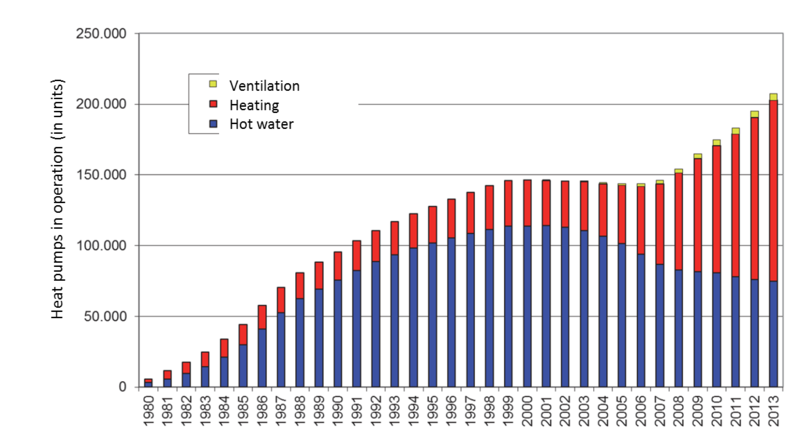 The share of heat pumps for DHW only in the stock of heat pumps is continuously decreasing since the beginning of 2000, whereas the one for heat pumps for heating purposes is increasing (see the following figure). Most heat pumps installed are electrically driven compression heat pump systems. (Biermayr et al, 2014). The market diffusion of FSHP in residential buildings is in a very early market stage with no official market figures available. The sharp increase of the market diffusion of heat pumps for heating purposes started at the beginning of the 2000s and was accompanied by an improved energy-efficiency of the residential buildings and a growing demand for low-energy houses. (Biermayr et al, 2014). The most popular heat source is air, especially air-to-water heat pumps experienced strong growth rates since the year 2004 and have a market share of 57,8% in 2013. Although the Austrian solar heat market is still facing difficult times, with sales declining for the fourth consecutive year, it remains one of the most important European markets, being the second largest market per capita in continental Europe and on the third position (Europe) respectively 7th rank (worldwide) in terms of total installed capacity. One of the main reasons to explain this decline is the attraction that solar photovoltaic and heat pump investment represent for consumers. Actually the main market of the heating resources moves bit by bit from new buildings to renovation whereby the actually small renovation installments will become a major influencing factor in the future. (ESTIF, 2014 and Biermayr et al, 2014). By the end of the year 2013 approx. 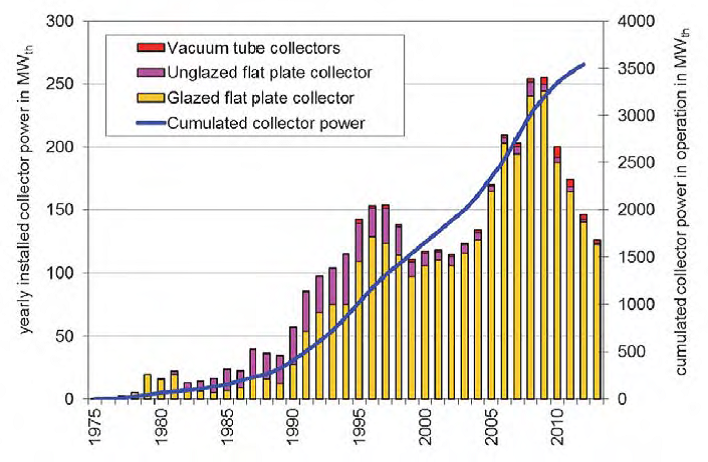 5 million m2 of solar thermal collectors were in operation. This amount corresponds to an installed thermal capacity of 3.541 MWth. The energetic utilization of solid biomass has a long tradition in Austria and is still a very important factor within the renewable energy sector. The consumption of final energy from sold biofuels increased from 142 PJ for 2007 to 179 PJ for 2013. The consumption of wood chips is increasing steadily since the beginning of the 1980s. The pellet market developed with an annual growth rate between 30 and 40 % until 2006 but stopped in 2006 due to a supply shortage which resulted in a substantive price rise. But meanwhile the production capacity has been extended and resulted in a market recovery. 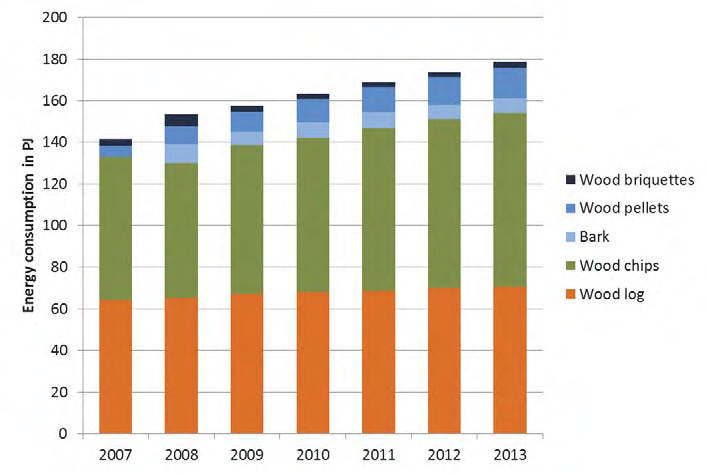 Figure Market development of different biomass fuel types from 2007 to 2013 in Austria. As far as air-conditioning and cooling of residential buildings is concerned, there is already some demand in selected customer segments. Although the cooling demand in Austria can be currently met by passive measures it is expected that due to global warming, more heat-emitting electric appliances inside the buildings and a rising need for comfort, this market is expected to be a promising one for the future. (Biermayr et al, 2014). According to Weiss and Biermayr (2009) the energy consumption for air conditioning in the residential sector in Austria will add up to 0.26 TWh in 2020, 0.57 TWh in 2030 and 0.83 TWh in 2050. In general, subsidies and incentives for heating and cooling technologies in Austria are provided on municipal (local), provincial (regional) and federal (central) level. Furthermore some utility companies are supporting the purchase of heat pump technologies via direct grants or favorable tariffs. The incentive on local level is mostly provided in form of a small direct, non-refundable investment grant, and is mainly supplied in addition to regional funding. On a regional level, small-scale renewable heating and cooling systems for the use in privately owned residential buildings are supported within the framework of the public housing subsidy schemes of the different provinces. Within these programmes, biomass and solar thermal systems as well as heat pumps are funded. Most provinces explicitly fund ground- and air-source heat pump systems when they are combined with PV or solar thermal . Also other measures e.g. the insulation of buildings (for companies), air conditioning and cooling systems (ad- and absorption cooling driven by renewables or industrial waste heat up to 750 kW), free cooling, process cooling with alternative refrigerant (NH3 or CO2), energy saving measures in companies (heat recovery, heat pumps, energy efficient production processes, efficient lighting systems, optimisation of heating systems in existing buildings) and induction ovens and LED systems are subsidised. The subsidy is generally between 30-35% of eligible (environmentally relevant) costs. In Austria co-financing for such projects is available via European Regional Development Fund (ERDF) and European Agricultural Fund for Rural Development (EAFRD). On federal level, there are no subsidies for small scale heating and cooling technologies for private homes, with one exception: the replacement of fossil fired boilers, electric night or direct storage heaters with newly installed pellets and wood chips central heating systems. A best practice example is the subsidy for the realization of large solar thermal plants for solar process heat, solar integration in heating grids, high solar yield (min. 20% of the total energy demand) in commercial and service companies, solar air- conditioning, solar integration in new technologies and innovative approaches where measurements and a possible accompanied research is provided to the end costumer. Due to the measurements and accompanied research higher quality installations can be guaranteed and customer confidence in the technology is foreseen. The funding is between 40 to 50% of total costs for solar thermal plants between 100 m² and 2,000 m² depending on innovation and accompanying measurement and monitoring. When it comes to heating (and cooling) commercial and industrial applications or office buildings, subsidies in form of direct, non refundable, investment grant are available for heat pumps, solar thermal and biomass heating systems in the framework of the UFI (“Umweltförderungsprogramm”) of the Kommunalkredit Public Consulting. The support generally lies in the range of 20-30% of eligible costs with a minimum investment of 10,000 Euro. AIT is the largest non-university research institute in Austria, and is specialised in developing sustainable energy systems based on cutting-edge research.